Day two of the Cherokee Rose Cluster sponsored by the Conyers Kennel Club. One would think that after taking 420 photos the day before that I’d have a better day today. No. Today the pugs showed in a different ring so I was having to adjust to a different spot around the ring and a different angle. Also, I got very overzealous about trying to get shots and some of the photos had more of the ring fence and the floor than they did pugs. There were also more pugs that showed today and more people there so I spent part of the time talking and not really concentrating on taking pictures. By the end of the day, I’d taken over 700 photos. Thank goodness for digital cameras and large memory cards! When I got home to look at the pictures, I got more quantity vs. quality. I had jumped all over the place and my photos were blurry. I might have to invest in a tripod. It would steady the camera and hold me to one spot. Needless to say, I was a little deflated by my novice camera skills. Once again, I did not upload all the photos, but just the ones that I feel like were the better of the images that had good lighting and minimal noise. But…any day spent with pugs is a good day! Okay people, this was it, the day that I’d been waiting on for weeks!!! AKC Conformation Show day!!! This was why I bought a fancy camera, have been going to 8:00am camera classes for the past 6 Saturdays, and why I had been marking the days off on my calendar. My personal dream is to be a professional photographer for ring/action shots at AKC Dog Shows, specifically to photograph pugs. That day is still a ways away, but I really felt like today was the first day in a step in the right direction. Today’s event was the Cherokee Rose Cluster sponsored by the Lawrenceville Kennel Club. I arrived super early, partly because I did not want to chance traffic and partly because my nerves were raw from being so excited. I am sure that I looked like a jumping bean to other people. 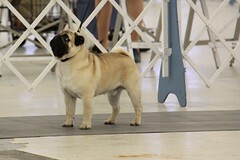 The pugs started going through the different classes of judging. I did not really feel that I had a great spot around the ring, but I am sure that is just something that I’ll have to overcome. I snapped over 400 pictures throughout the morning. I walked away feeling pretty good about my first conformation show with my new Canon. The reality of my skills came when I got home and pulled them up on the computer. It is a lot harder to get great shots that it looks!!! Part of it is lighting-or lack of lighting. Part of it was noise from the zoom lens-which equates to camera shake and a picture that does not have sharp edges. Part of it was knowing what shots to get-I am trying to learn as much as I can about the show side so that I can anticipate the shot. And finally, part of it will just be practice, practice, practice. I really debated whether or not to put up all of the photos or just the ones that were the better photographs. In the end, I decided that no one wants to go through all of the photos so I picked the pictures that had the best composition and lighting. Beyond the camera, I just love pugs so much and it was such a joy to see the adorable pug faces!!! I never get tired of seeing beautiful (and handsome) pugs! Another great thing about going to the shows is meeting the people who are so dedicated to the betterment of the breed. Pugs come to rescue from a variety of sources: owner surrenders, puppy mill surrenders, shelters & animal control agencies, etc. How does rescue work? Once a pug comes into rescue, they are spayed/neutered, receive any necessary vaccinations, are heartworm tested and started on HW preventative, receive any other medical care needed. 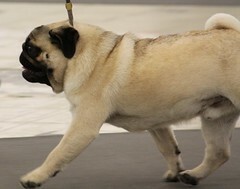 They are also evaluated on their house training, socialization, personality, and any other characteristics of the pug. The pug stays in a foster home and gets the opportunity to recover from any medical treatment and gets the opportunity to socialize with people and other pets. If you want to adopt a rescue: You’ll need to fill out an adoption application. Be honest! It is in the best interest for you and the pug. If you only want a 1-3 year old female that is good with cats, put that down. 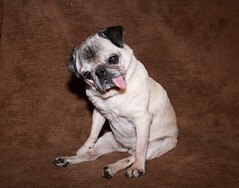 If you are truly able to provide financially & emotionally for a senior or special needs pug, but that down (but not just because you feel sorry for the pug). Not all pugs are listed on the websites/petfinder for each rescue. 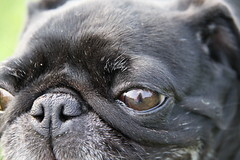 Rescues usually have a bank of applications on file, if a pug that comes in fits someone who has been previously approved, the pug may never go on the website. Don’t be discouraged why what you do or don’t see in the internet. There is a never ending supply of pugs that come in on an almost daily basis. 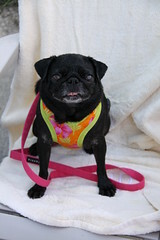 It is not a first come first serve option; pugs are carefully matched to homes based on age/gender/other pets/etc. •	Once you’ve filled out an application-be patient. Rescue works solely on volunteers. Most of the volunteers have jobs, families, and other activities and they are donating their time to help the pugs. Also, vet references and personal references have to be checked and this is time consuming also. •	You will start to work with an adoption coordinator to determine the right pug for you and your family. I stressed above to be honest about what type of pug you are looking to adopt, but in the same sense, be open to what the adoption coordinators have to say. Most of them have been doing this for awhile and may have some insight that you did not consider. 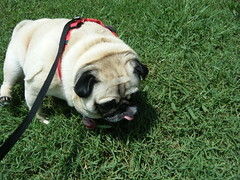 For example, lots of people put they want a younger, 1-3 yrs old, pug. But they don’t stop to think that pugs are still very active until age 5-6. Can you physically commit to excising a younger dog? Are you away from home 8-10 hrs a day? A younger pug is going to get bored and start to look for other means of entertainment, which might be the legs of your coffee table. 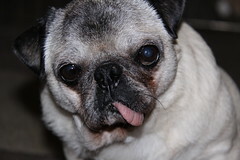 Do you feel sorry for an older pug and want to give them a good home? But your young child might not know that pulling the senior’s tail will hurt the pug. Does your heart break to see a disabled pug? You can probably see how working closely with an adoption coordinator will benefit you and the pug by evaluating your home, work, physical ability, family dynamics, and current pet personality to find just the right pug for you! Once you adopt: Once you have found the right pug for you it is just the best feeling in the world! You and the pug are starting a new life together and there is so much joy and good times to come. But it may not be paradise in the beginning…you will need to remember that your new pug, although happy to be with you, may need time to adjust to a new home, new smells, new routine, etc. I always say that it takes any dog 2-3 months to fully adjust. Don’t be scared by that amount on time; you may have good and bad days. Your new pug may seem to have gotten adjusted by day 2, but a week later has a potty accident. Just be patient and don’t stress out over the little things. As each day goes by, you and your pug will become more and more bonded to each other. This pug is depending on you for their food, shelter, and emotional needs and in return, they will give you all the love and affection you can handle! If for some reason it doesn’t work out: Rescues do everything that they can to match the right pug with the right people. But for whatever reason, the pug does not adjust to your home, seek out the rescue for advice & tips. 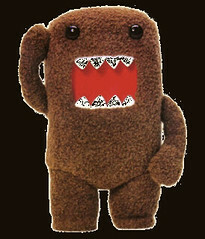 Normally the foster home will be available to answer any questions and provide suggestions for behavioral modification. But sometimes things just don’t work out, depending on the rescue and the contract you signed; you must return the pug to the rescue agency. Don’t take it upon yourself to find the pug a new home! Also, if your home/financial/residence/job/etc changes and you don’t feel that you can provide for your pug, it is your responsibility to contact the recue that you adopted your pug. For a couple of weeks now, Baby Girl has been having problems with her back legs. It was as if she just woke up one morning and she was having back problems. I immediately took her to the vet’s office and we started her one some meds. She has gotten a little better. I took this video so that my vet could see how Baby Girl walks (or stumbles along). It is hard to demonstrate this when you are at the animal hospital because the floors are so slick. Most of the time, I either carry Baby Girl around or she gets to ride in her stroller so things are all bad! Doggie Paddle is held each year at Warner Park. It is a fund raiser for McKamey Animal Care and Adoption Center. The last Saturday of the season is for the dogs! They close the pool and let the dogs go swimming for the day. They have 2 kiddie pools and the large pool so dogs of all shapes and sizes can join in on the fun. Lola does not especially like to go swimming, but it got sort of hot so I put her in the baby pool for a few seconds to cool her off. I went crazy taking photos. The sun was very bright so some of the pictures are over exposed. Some are pretty good one considering the direction of the sun and my angle. I think that I got some nice shots of the dogs jumping in the pool and swimming around. Overall, it was a great learning experience with my new camera. I’m in love with my Canon 50D! This is it! I finally got up the nerve to take my camera to the dog park so I could test this baby out!!! And I am in love with this camera. It is amazing at how fast it is and how clear the images are!!! There’s no turning back now! This is one of my favorite pictures from today, because you can actually see me taking Lola’s picture in the reflection of her eye. And Lola was a great subject to photograph! Friday night: It is the eve before I get my new camera. My mind has been whirling all day. I have been trying to come up with a name for my new photography business. I have been checking out different companies to build me a new website. I have been doing domain name searches to see what options I have for a new URL address. I was just about at the point of my brain exploding. I asked my husband what he thought about different names, ideas, and concepts. He told me to get the camera and learn to use if first. Wow, that was a blow to my ego. I went to bed that night a little deflated. Saturday: It’s camera buying day!!! I carried a big ol’ bag of goodies out of Wolf Camera with a smile about as big as my bag! I had plans to take Lola to the dog park, but it ended up being a completely crazy day so I did not even look at my camera after I left the store. Sunday: What have I done to myself??? I don’t know how to use this Canon 50D what so ever! I got the battery charged up, the lens attached, the memory card inserted, turned it on, and just about burst into tears. I took a couple of pictures, but it wasn’t as easy as I thought it was going to be. I put it on the standard setting snapped a couple of pictures. They are very clear, but I guess that I took for granted that I have used my Canon Powershot S5X IS for over a year and could just about operate it with my eyes closed. I have got a lot of learning to do on this camera. I think that I am going to table my big plans to be a professional photographer until I can get the hang of this thing. Wednesday: Got my camera out again, and I am starting to get a little more comfortable with it. At least I figured out how to zoom! LOL! I like this picture of Baby Girl, even though she looks kind of pitiful. She is still my sweetheart. I found this stuff toy at Target. I got it for the pugs, not that they need a new toy or even play with 1/2 of the ones they have. It is Lola’s new favorite toy, Baby Girl is afraid of it! You are currently browsing the papaspugs.com Blog blog archives for August, 2009.